October is Breast Cancer Awareness Month. 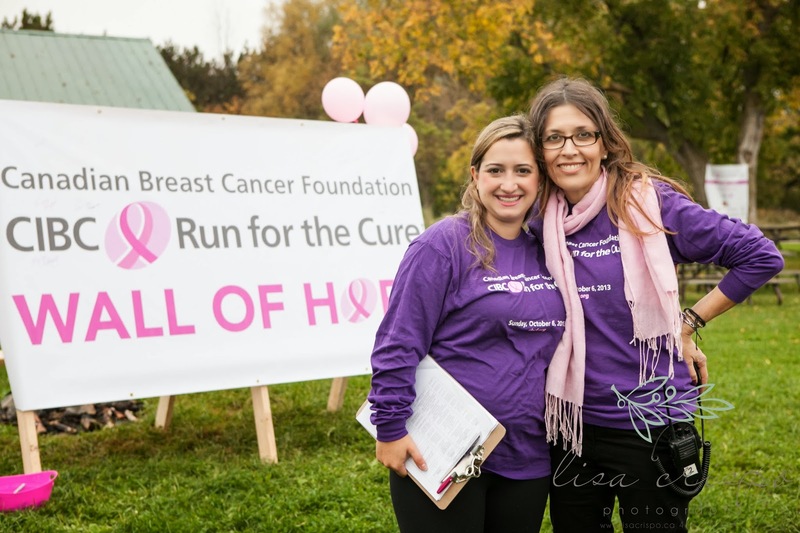 I realize this post should have come over a week ago, but I've been pretty busy planning the Canadian Breast Cancer Foundation CIBC Run for the Cure. 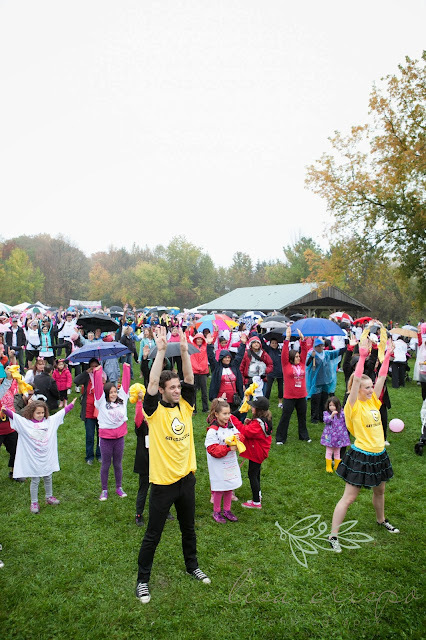 This year, the Run had a brand new site for Woodbridge/Vaughan and more than 1200 participants came out in the drizzle to walk or run and raise awareness for this cause. I am so honoured to be one of the volunteer Run Directors for this wonderful event, and along with an amazing volunteer committee, we put on an impressive inaugural event in my hometown! It really is like another full-time job, but it's so worth it. I'm super thrilled and proud to announce that our site pulled in nearly $200,000 as of Sunday, October 6 and that number keeps increasing as donations roll in. Thank you to everyone who has donated to me personally -- and if you haven't, it's not too late. To donate, click the purple button in the right sidebar. It's so great to see that many companies and organizations are embracing Breast Cancer Awareness. Like the NFL. I wouldn't exactly call myself a football fan, but seeing a bunch of burly men with hot pink laces or gloves is a really cool thing. They are running their"Crucial Catch" campaign, encouraging people over 40-years-old to get screened. You can also buy some of their pink gear right off the website. Good on them. Another company that's winning a prize in my books is Cleaning for A Reason. Cleaning for a Reason is US-based foundation with partners all over the States and Canada that provides FREE House Cleaning for women undergoing treatment for cancer. Since May 2006, 13,614 cleanings have been performed. There are already a handful of local cleaning services that have signed up for this Foundation - check them out. If you have a cleaning business and would like to donate your services, you can apply on their website. Alternatively, if you are currently undergoing treatment and would like more information, you can find that online too. What an amazing, compassionate idea. I can't imagine what a help this service would be to a woman who has just received a chemo treatment or a round of radiation. It's a priceless gift. Lastly, at the end of the month, I will be working once again with the Markham Stouffville Hospital Foundation to produce the 25th Annual Celebration of Hope Luncheon. Rogers TV has been a long-time supporter of this event that has continually raised money for the new -- and impressive -- Breast Health Centre at MSH. I think it's fabulous so many people and businesses are celebrating PINK this October. Of course, our work isn't done just yet - we need to continue to come together to raise awareness, raise money and raise hope. 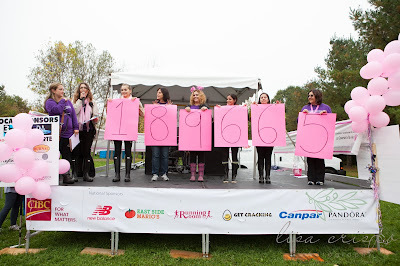 As is our motto at the Canadian Breast Cancer Foundation, together we will "Create a Future Without Breast Cancer." What an amazing result for all of your hard work. Breast cancer awareness is so important to me and my family. My mom has breast cancer and it's been a horrible battle. But the research being done makes the treatment and the research more advanced. Thanks Kerrie. Keeping your mum in my thoughts. Congratulations on a job well done! Our family participated in the CIBC Run for the Cure in Toronto and seeing the HUGE amount of coordination that goes into an event like this makes me think that you are being modest calling it a "full" time job. I'd guess it was a lot more than that but worth every minute. I had never heard of Cleaning for a Reason before. It sounds like a service that is much needed and will take a small burden off a woman battling breast cancer. Thank you for all your hard work. What a great (and HUGE) job you did for organizing and coordinating this event in your hometown. I'm sure it was worth all the late and sleepless nights. Looking forward to reading more about your work with CBCF and I hope to join you next year for the run.